We have released Auto PeakTrace 6.93. This update improves the control of Auto PeakTrace from the command line and brings it into parity with the peaktrace.exe command line version. It is recommend that all users of peaktrace.exe change to using Auto PeakTrace as peaktrace.exe will not be updated in the next major release of PeakTrace. The full list of changes includes. New Feature. Command line control of QualTrace III options. New Feature. Command line control of the manual override settings. New Feature. Custom PeakTrace and QualTrace log file names and paths can be set from the command line. New Feature. Auto PeakTrace can be run in watch mode checking for new .ab1 file in input folder from the command line. New Feature. The header line can be removed from log files with -sh option on the command line. If Auto PeakTrace crashes in command line mode it will restart in command line mode, but not output any message to the command window. CodeMeter runtime requirement upgraded to 6.80. 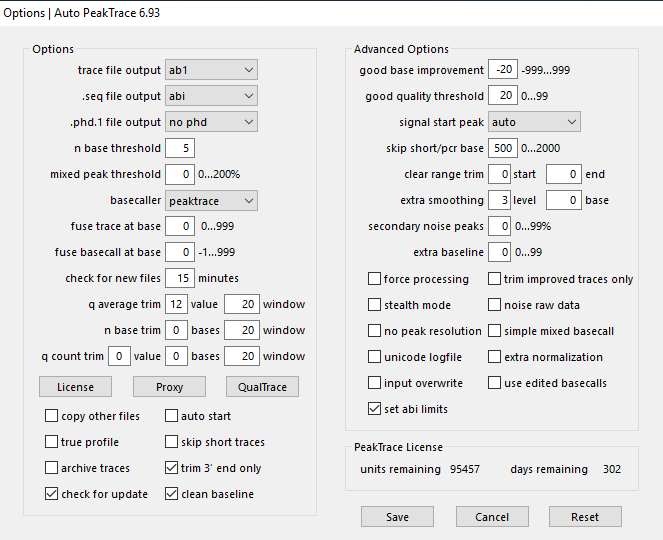 Auto PeakTrace 6.93 can be downloaded from the PeakTrace:Box Downloads page. If you do not know the password to access the PeakTrace:Box Downloads page please contact us @support@nucleics.com or contact your local supplier for the update.